Over 75 township supervisors from across Chester County attended a recent conference to learn more about various topics, including autonomous vehicles, economic development strategies, the nationwide opioid crisis, affordable housing, and pipelines. The Chester County Planning Commission partnered with the Chester County Association of Township Officials (CCATO) to make the organization’s spring 2018 conference a success. Planning Commission staff participated in four of the five breakout sessions and staffed a booth to promote the agency and the progress being made on Landscapes3, the county’s next-long range plan. 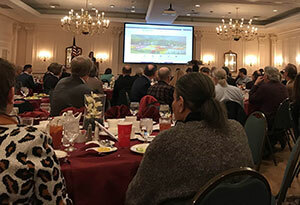 Agricultural Development Director Hillary Krummrich presented the keynote address at the event, which took place March 13 at the Desmond Hotel in East Whiteland. She spoke about the Ag Council’s initiatives and services. Trails and Open Space Planner Rachael Griffith participated in the Autonomous Vehicles and the Future of Mobility panel. The panel discussed the expected impacts of connected vehicles, autonomous vehicles, and advanced transportation technologies on existing transportation infrastructure and new strategic directions. These technologies are expected to have a significant impact on the planning of our communities in the near future. Planning Commission Executive Director Brian O’Leary participated in the Igniting a Healthy, Sustainable Chester County Economy panel. This panel discussed aspects of VISTA 2025, a Chester County public-private partnership effort that is focused on creating and implementing an economic development strategy for the county. The panelists talked about the needs, critical core services, planning, and other variables as they relate to economic development strategies. Planning Commission Planning Services Director Susan Elks participated in the Housing Needs in Chester County panel. This panel discussed affordable housing options, walkable, mixed-use neighborhood options, accessory dwelling units, tiny houses and related planning issues. Planning Commission Infrastructure and Plan Review Director Carol Stauffer participated in the Laying It on the Line: Pipelines in Your Township panel. This workshop provided an overview of major pipeline projects in Chester County, how these pipelines are approved and regulated, and the role of townships in the siting, construction, and operation of these pipelines and related facilities. Chester County Commissioners’ Chair Michelle Kichline also spoke at the conference and highlighted Landscapes3 as one of the commissioners’ priorities this year. Learn more about Landscapes3.